Economize! $8.00 escolhendo essa opção agora. 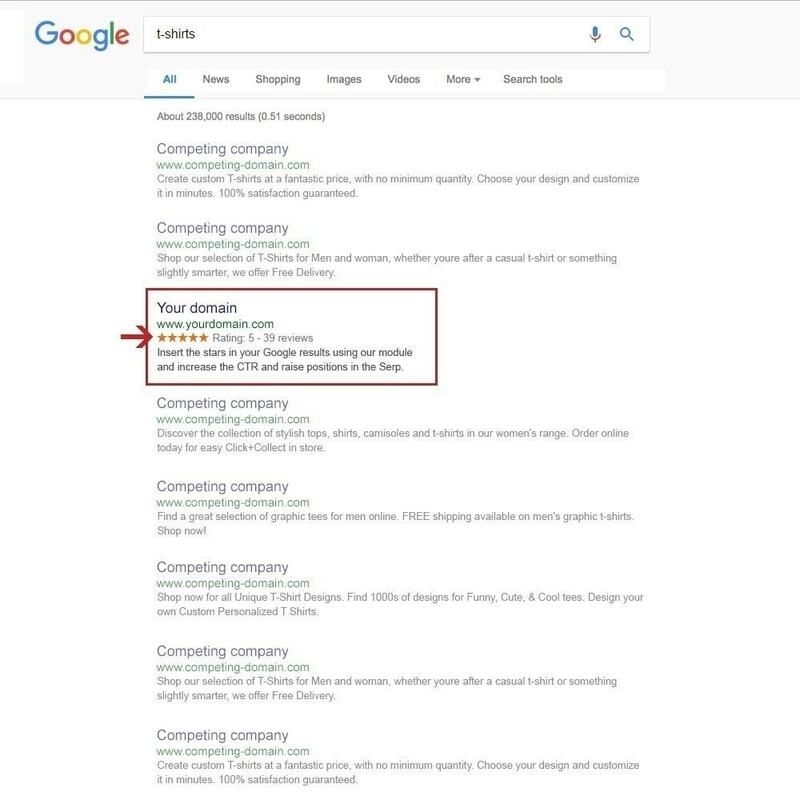 Through our module, and using Rich Snippets, you can make your online shop show a star average rating in the Google search results for each Category, Product and CMS pages. Insert the stars in your Google results using our module and increase the CTR and raise positions in the Serp. 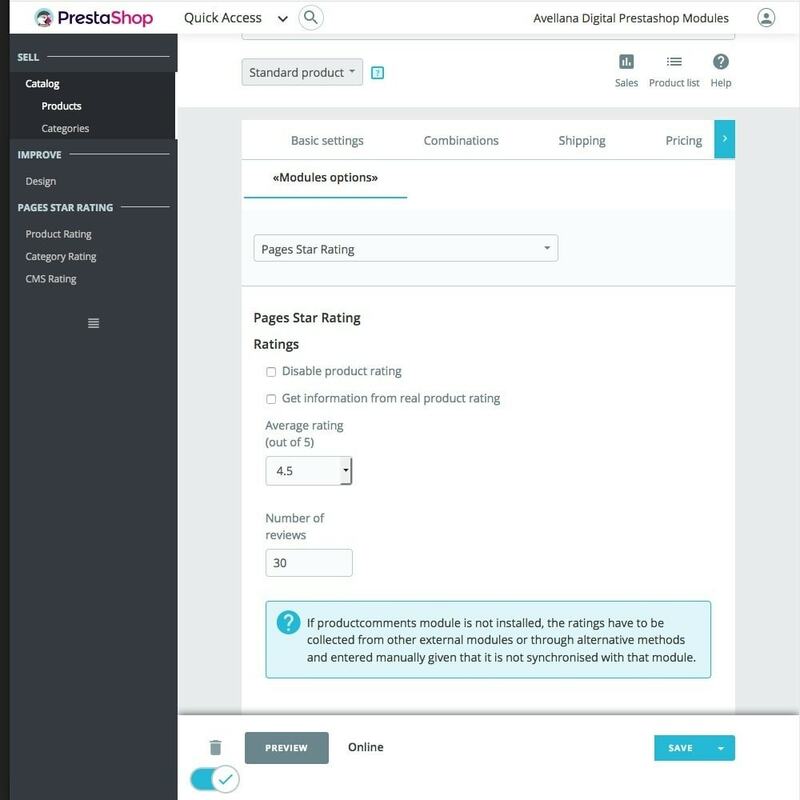 The module combines with Prestashop, the comments module, but if you haven’t installed it or enabled it, you can also add a rating manually for the product or category in the edition tab itself. The rating is shown with stars in the hook and the template can be overwritten usersonalised theme to adapt it to your shop’s look. Google then shows these stars on the search results, increasing the chances of users clicking on your link and thus improving this important scale for the search engine. 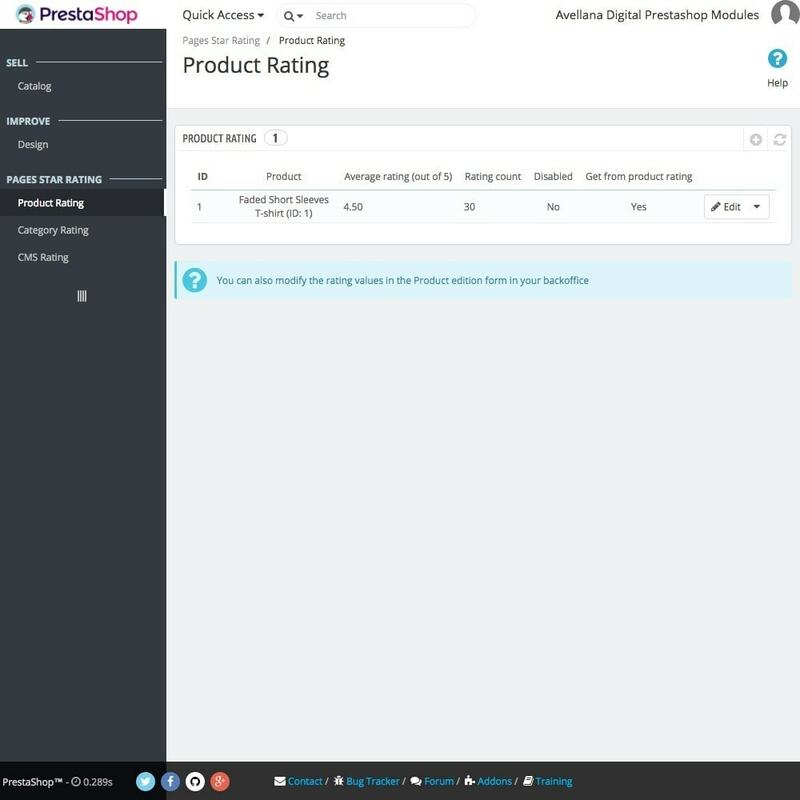 If you have the Prestashop rating module installed, you’ll be able to choose whether you want to show the rating data for this module or to manually enter the average rating for each category or product independently. If you don’t have the Prestashop rating module installed, you’ll only be able to enter the average rating manually and the number of opinions. These ratings must be collected from other external modules or through other alternative methods. If the average rating is going to be entered manually, you’ll be able to choose an average rating between 0 and 5, including a decimal value, as well as the total number of ratings, for example: “4.6 out of 5 from a total of 12 ratings”. It improves the user experience and increases the percentage of clicks. Your online shop pages will be shown with a star rating on the Google search results, this will increase trust in your shop and will encourage users to visit your product pages, increasing sales. At Avellana Digital we have more than 10 years of experience in the implementation and development of e-commerce in Prestashop. Our team also develops modules for Prestashop that provide solutions to specific needs. Through our module you can create different events (concerts, workshops, seminars, lectures and activities of all kinds) and sell their tickets in a simple and fast way. Through our module you’ll be able to increase your conversion rate of adandoned carts by up to 30% as a consequence of Implemented advanced actions. Through our module, we can calculate and manage payments to suppliers who have giventheir products on deposit or royalty. It calculates monthly the products sold and the amount that mustbe paid to the supplier.